When Jason and I first met, he cooked approximately 3 things: pasta & meat sauce, Texas Toast, and Stouffer’s Lasagna. Two pastas and one something that you eat with pasta. The only vegetables in his diet were tomatoes and garlic and those only came in the form of pasta sauce. I mean, how was a life without guacamole even worth living? But here we are on the cusp of 9 years of marriage and blogging (! ), and he’s going back for a third serving of eggplant lasagna. Garden season is slowly winding down for the year – soon I’ll be pulling up the squash plant carnage and spent tomato vines, getting ready for broccoli and cauliflower. The fig tree is pushing out its final crop of the year and the eggplant is… my God, the eggplant. We can’t eat them fast enough. While everyone else is enjoying the spoils of fall, we’re still eating figs and eggplant. That 2lb beauty right there was turned into an amazing lasagna. 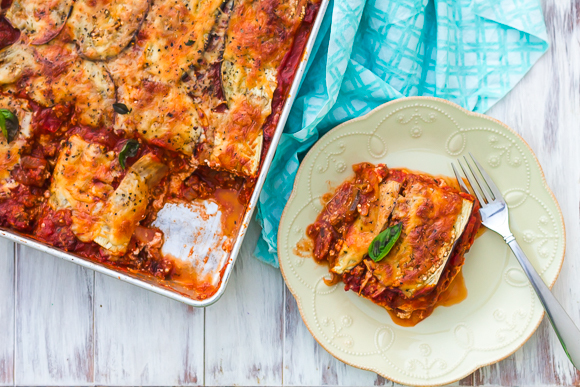 3 layers of thinly-sliced eggplant alternate between layers of mozzarella, ricotta, parmesan, and a hearty, beefed-up meat sauce. Unlike the bachelor’s days-Stouffers, this one isn’t a calorie or sodium bomb. And unlike many vegetable lasagnas we’ve tried before, we weren’t left with a bland, watery mess. I cut calorie- and fat-corners where I could but worked to keep in plenty of flavor. Project Kidney might officially be over as I found out that I can’t donate to my mom – but half-marathon training season is here. And you know it’s good when you’re looking at the calories you have left for the day and have trouble deciding if you should spend it on a scoop of Ben & Jerry’s Half Baked or go back for another square of lasagna. 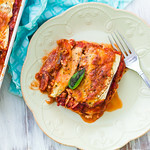 Hearty lasagna made with eggplant "noodles" - low calorie, reduced fat, but full of flavor. Trim the ends off the eggplant and thinly slice - a mandoline will make this so much easier, I used the next-to-thinnest setting. so probably somewhere between 1/8- and 1/4-inch thick. Otherwise go at it with the sharpest knife you have. 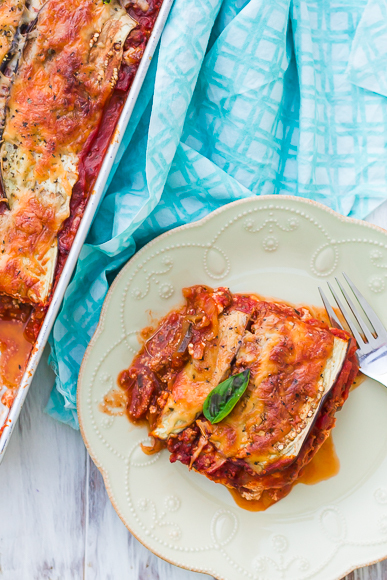 Lay the eggplant slices on two racks balanced over the sink or on top of a baking sheet. Generously salt and let "purge" for 20 minutes. Flip the slices, generously salt again, and let sit for 20 minutes. 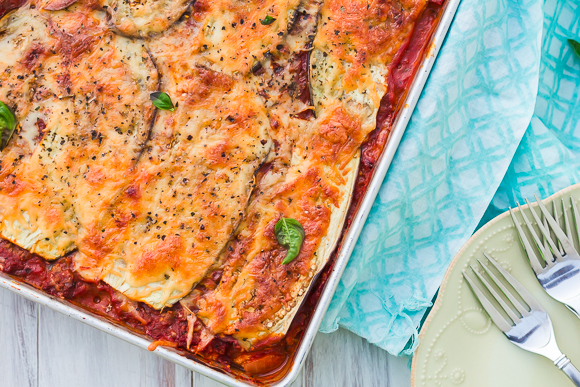 While you're waiting on the eggplant, preheat the oven to 400 and spray a 13x9 baking sheet with cooking spray. Spray a large pot or sauce pan with cooking spray. Turn heat to medium-high and add the onions, cooking for 3-4 minutes. Add the garlic and 1 tsp of Italian seasoning to the pot and crumble the ground beef into the pot, stirring frequently until browned and cooked through. Add the pasta sauce to the pot, stir, reduce the heat to medium and let simmer for a few minutes. Stir the ricotta in a small bowl and mix in ground pepper, a couple dashes of ground nutmeg, and the large egg. Set out two stacks of a triple layer of paper towels. Rinse the eggplant and place on top of one stack of 3 paper towels, cover with the other 3. Press down on the eggplant to remove any excess water - I give it a couple rolls with a rolling pin. Line the prepared pan with eggplant slices, cutting down slices as necessary to fill any gaps and completely cover the bottom. Top with half of the meat sauce and spread evenly. Top with another layer of eggplant followed by all of the ricotta mixture, spreading evenly. Top with half of the mozzarella and half of the parmesan. Layer the remaining slices of eggplant on top, followed by the last of the two cheeses. Sprinkle the remaining 1/2 tsp of Italian seasoning and a few grinds of black pepper over top. Transfer to the oven and bake 40-45 minutes until the top is golden brown. Let sit ~15 minutes before cutting into 12 squares.